Jellyfish are one of the most common inhabitants of the sea and while they are soft and squishy, their venomous stinging cells (call cnidocytes) can act as a deterrent for many potential predators. But not all predator though - jellies are on the menu for a wide range of different marine animals including sea turtles and various species of fish - this is a fact which has been exploited by some species of parasitic flukes (digenean trematodes) as a mean of completing their life-cycles. Flukes have a rather complicated life-cycle which involves multiple different hosts. While the adult stage lives in vertebrate animals, they lay eggs that hatch into larvae which infect a "first intermediate host" (usually some kind of snail) where the parasite undergo asexual proliferation, producing a different type of clonal larval stages that infect a "second intermediate host" which serves as a vehicle to reach the vertebrate host. This is usually accomplished through the vertebrate host eating the second intermediate host. For some species of flukes, such as Opechona olssoni, the second intermediate hosts are sea jellies, and it is not alone - some of its fellow travellers include Leptotrema clavatum and Cephalolepidapedon saba - all flukes from the Lepocreadiidae family which is commonly known to use gelatinous animals as their second host. 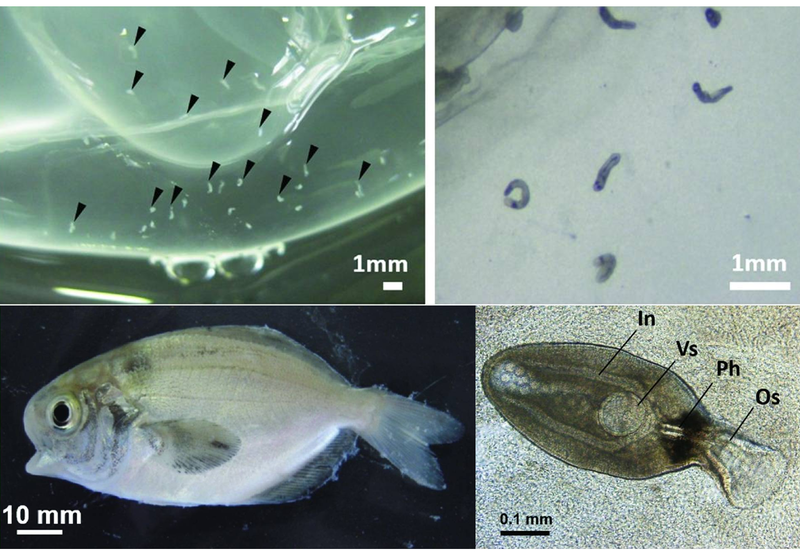 In this study, a team of researchers in Japan set out to examine the seasonal pattern in the abundance of parasitic fluke larvae found in some of the jellyfish inhabiting the Seto Inland Sea. Over the course of two and a half years from March 2010 to September 2012, they collected three different species of jellyfish: the moon jelly (Aurelia aurita), the Japanese sea nettle (Chrysaora pacifica). and the ghost jellyfish (Cyanae nozakii). They noticed that while the fluke larvae were consistent present in the jellyfishes for most the year, their abundance varied over different seasons. Sea jellies were most heavily infected during the middle of the year when it is the warmest. Since the free-swimming clonal larvae of digenean fluke use temperature as their trigger to leave the first intermediate host, when things start heating up, they come streaming out of their host in large numbers. Out of the three different species jellyfish species they sampled, the ghost jellyfish was the host with the most. While the moon jelly and the sea nettle on average harboured about 28 and 8 fluke cysts respectively, the ghost jellyfish had on average almost 150 fluke larvae, with some individuals carrying over 400 cysts in their tissue. But why are the ghost jellyfish so much more heavily infected than the other jellies? It is only slightly bigger than those other species, so size alone cannot be the answer. Well, the ghost jellyfish is also known to prey on other gelatinous animals, and by doing so it could have been accumulating an impressive collection of fluke larvae second-hand (so to speak). Due to its jelly-eating ways, the ghost jellyfish earns itself the dubious distinction of serving as a hub for all these flukes to come together as they wait for a final host to come along and gobble them up. But if the sea jellies are the second intermediate host for O. olssoni and friends, then what are the final hosts where the parasites mature into their adult form? Flukes from the Lepocreadiidae usually use fish as their final host, so the researchers also collected some fish species which are known to either associated with and/or have jellyfish on their menus, since they are the most likely final host for those parasites. They examined their gut content for bits of half-digested jellyfish and the adult form of the jelly-infecting fluke species. One of the fish which they found to harbour maturing and/or adult flukes is the Japanese butterfish. Juvenile butterfish are known to hangout around the tentacles of jellies, using them for food and shelter, taking a few nibbles here and there whenever they get peckish. Alongside the butterfish, another species that hosts those flukes is a filefish known as the black scraper. It eats a variety of different marine invertebrates, but is known to partake in some jellies now and then. Myxozoans are a group of very unusual parasites. Despite their simplified structure, latest research has shown that their closest living relatives are actually jellyfish (which means they are technically animals). They are found in a variety of tissues and organs in their hosts which are usually fish, and in some cases, amphibians. Some causes diseases such as the salmon whirling disease, and in the case of certain fish-infected myxozoans, after the host dies, the parasite causes the flesh to melt - much to the frustration of fishermen. While the majority of known myxozoans infect fish, in the last decade, there has been increasing interest in studying myxozoans that infect amphibians, and the parasite featured today is one such species. Cystodiscus axonis is a myxozoan species which lives in either the brain or the gall bladder of their frog hosts. This parasite and its close relative C. australis is found in a range of native Australian frogs. 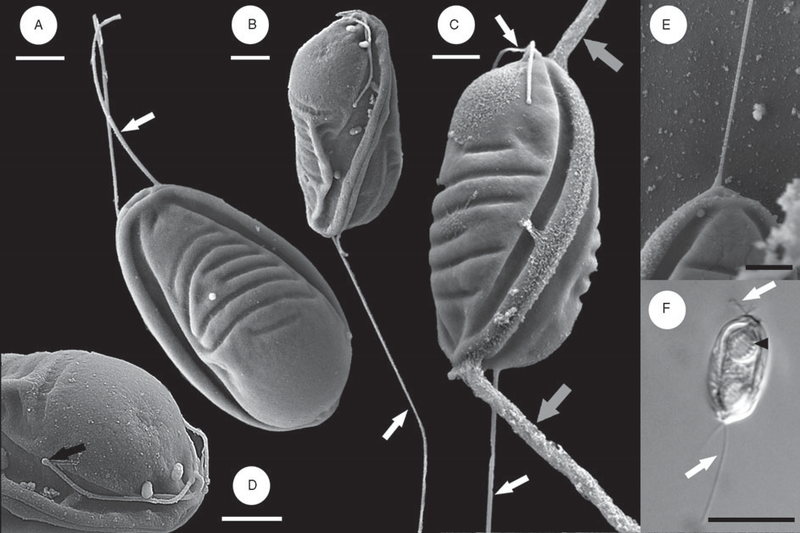 This parasite was previously classified in another genus called Myxidium and its discovery (and reclassification) featured a number of twist and turns. The parasite was first recorded in cane toads which have been introduced to Australia, so it was originally thought to be a parasite that the cane toads had brought with them into Australia and had since taken to infecting Australia's native amphibians. However, examinations of older frog specimens from museum collections, including those that were collected before the introduction of cane toads to Australia, revealed that the parasite had been in native Australian frog all along - the cane toad simply picked it up when they arrived and they turned out to be a really hospitable home for this parasite. Caecilians are very strange looking amphibians - they are legless, look kind of like giant earthworms, and they are very different to either toads and frogs. For this study, the scientists examined 148 caecilian specimens spanning across twelve species which are found in a variety kind of habitats, ranging from terrestrial, burrowing forms to aquatic species. Out of those, they found seven specimens which had myxozoan spores floating in their gall bladder. All the infected caecilians belong to one of two species - Typhlonectes natans and Typhlonectes compessicauda - and both of them are aquatic caecilians. Based on the shape of those spores and sequences of their DNA, the parasite they found was almost identical to C. axonis from Australian frogs. So somehow, C. axonis has managed to successfully make a jump to caecilians too - but how? The native frogs of Australian and caecilians are separated not just by a vast ocean, but also 300 million years of divergent evolution - so how did these legless amphibian parasites end up with a parasite which is originally found in Australian frogs? A vital clue might be the fact that the infected specimens were originally captive animals. Myxozoans use different host in their lifecycle - they usually alternate between a vertebrate and invertebrate host, so the infected caecilians might have become infected when they were fed invertebrates, such as tubifex worms, which were parasitised by C. axonis. Alternatively, they might have been housed or shared a water supply with other captive amphibians that were infected. Given its ability to jump to a dissimilar host like caecilians, this explains why they were so receptive to cane toads when they were brought to Australian. Compared with the evolutionary gulf that separate frogs from caecilians, the native frogs of Australia and the introduced cane toads are practically kissing cousins. Given the presence of an Australian frog parasite in South American caecilians, just how widespread have C. axonis and similar parasite have become? The lethal amphibian chytrid fungus Batrachochytrium is an amphibian pathogen which has now been spread all over the world due to the global trade in amphibians. So what other parasites might be lurking in the loads of frogs, salamanders, and caecilians which are currently being shipped all over the globe? Hartigan, A., Wilkinson, M., Gower, D. J., Streicher, J. W., Holzer, A. S., & Okamura, B. (2016). Myxozoan infections of caecilians demonstrate broad host specificity and indicate a link with human activity. International Journal for Parasitology 46: 375-381.